iOS 11 contains a number of hot features sure to please iPhone and iPad users, and one of the more underrated utilities is the operating system's new document scanner. Functionality that was once relegated to third-party apps is now native to iOS 11, and using the tool, Apple users can scan and back up old photos, menus, receipts, business cards, and more. Document scanning apps have been out for a while now, so the process has become streamlined; fortunately for everyone curious about how they work, we've got all the must-know details about how to use the iOS 11 document scanner outlined below. Using the native iOS 11 document scanner is simple, and the process begins by opening up Notes. Within any note, hit the + symbol that can be found above the keyboard to open a new options menu. From there, look for the choice to "Scan Document" in order to open up the iOS 11 document scanner. After that, the device's camera will open up, and users will be instructed to keep the document to be scanned within the photo frame. 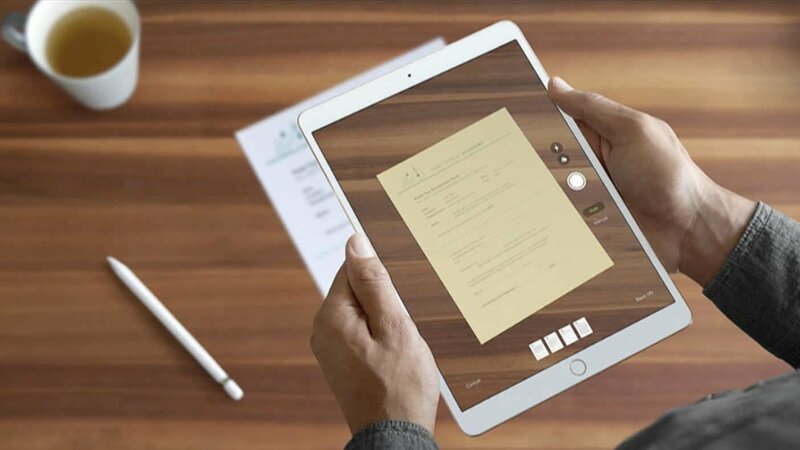 From here, users can tap the shutter button to automatically capture the document in full-color, or steadily hover the iPhone or iPad over the document in question to have the Document Scanner tool capture an image on its own. Easy, simple, and straightforward. If users want to try to scan a document manually, or perhaps capture one in grayscale, there are a few other simple options to make use of. There's a button near the top of the screen that looks like three circles -- tapping on it will prompt users to chosoe between color, grayscale, or black and white options, the latter of which is best for text-heavy documents. Users can also choose these options after the document has been scanned, so there's no real need to make the choice beforehand. Also, instead of simply taking a photograph manually or automatically, users can use more traditional document scanning functionality by giving the utility the chance to align the photograph using four distinct corners. This is the same way other photo scanning tools, like those available for Android devices, work -- simply get the photo or document in-frame to have the corner markers appear, then slowly move the camera in a flat plane over the four corners. The software will align the pieces of the photograph or document into a flat and glare-free image. Fortunately for most users, this old-school approach isn't necessary; Apple is ahead of the curve on the document scanning front, and their tool allows users to capture images quickly, even at surprisingly angles, and have the result come out looking like the sort of clear images we would have gotten from bulky and expensive scanners back in the early 2000s. And, unlike old-school scanners, the iOS 11 tool allows users to hit Save to export the scanned image to their photo roll and then easily share it with their family or friends using a number of different apps. Users can also add annotations or other markups using the Share menu, too, in case they need to point to specific information or add in a comedic evil mustache. iOS 11 features the best features on the most modern OS to hit mobile devices. And, unsurprisingly, it also supports loads of games like the ones we've lovingly featured on our list of the Best iOS Games.